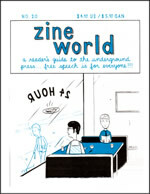 Zine World: A Reader's Guide to the Underground Press - ZineWiki - the history and culture of zines, independent media and the small press. The review staff included: Ailecia Ruscin, Andrew Mall, Chantel G., clint johns, Dann Lennard, Emerson Dameron, e.war, Jaina A Davis, Heath Row, Laura-Marie Taylor, Ryan Mishap, Susan Boren, and Tom Hendricks. Past reviewers include: Alan Lastufka, artnoose, Fred Wright, Jason Koivu, Jeff Kay, Joe Biel, Joe Smith, Kyle Bravo, Marc Parker, Michael Jackman (also former news editor), Sean Stewart, Stephanie Webb, and Violet Jones. 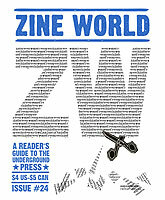 Sarah and Jen Wolfe Zine Collection at The University of Iowa. This page was last modified on 6 July 2017, at 10:49.